Comments: The red-tailed hawk is a very diverse hawk that comes in a wide range of sizes and plumages. They are also adapted to many different types of habitats. Their plumage coloration can range from very light to very dark, with more variation in the western half of their range. The chestnut red tail can distinguish most mature birds. Tail feathers of the Harlan’s race have a marbled pattern of gray, brown and white. 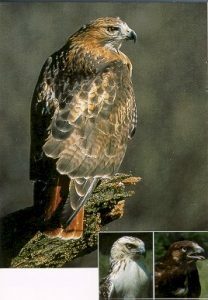 Distribution: It is the most widely distributed Buteo hawk in North America and is found from Alaska throughout most of Canada and the United States, south into Mexico and parts of Central America. In Kansas, it is found year round and is commonly seen perched on fence posts, utility poles and billboards along roadways. It is the most frequently encountered nesting raptor in the state. Food: Red-tailed hawks often hunt from a perch but sometimes hunt while soaring. They search for a variety of prey including invertebrates, reptiles, birds, rodents, squirrels, rabbits and hares.